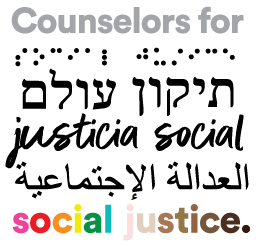 Counselors for Social Justice works to promote social justice in our society through confronting oppressive systems of power and privilege that affect professional counselors and our clients and to assist in the positive change in our society through the professional development of counselors. CSJ began through discussions between individuals from groups such as the Association for Multicultural Counseling and Development (AMCD), the Association for Specialists in Group Work (ASGW), and the National Career Development Association (NCDA), who wanted to discuss the multicultural competency movement and the opportunity for ACA to better commit to multiculturalism. Social justice is an issue that touches all lives. In 2018, CSJ joined with AMCD, ALGBTIC, and ASERVIC in solidarity to begin a new practice of joint webinars, advocacy statements, and service days as well as continued collaboration and support of social justice. ​CSJ prides itself on being the conscience of the American Counseling Association, and to promoting social justice action. We are a group of counselors and other professionals committed to discussing and addressing systemic forms of oppression in our society and in our profession. We acknowledge that power and privilege play a role in the lives of all of us, including our clients and graduate students. To that end, CSJ is the professional home for counselors dedicated to social justice ideology and efforts. We embrace your wisdom and passion you bring towards ending social injustices in the world. Welcome!